Hockley is built on free draining chalk downland, which means it remains playable in all but the harshest of winter conditions. We rarely need to use temporary greens or tees and, as a result, members and visitors have the chance to play meaningful golf year-round. We are naturally gifted with a James Braid course, on a beautiful piece of land set within the South Downs National Park and the course is a pleasant walk. It meanders gently up a valley before reaching the top of the downland and the stunning views across the city of Winchester and south towards the coast. On a clear day you can make out the Isle of Wight in the distance. The walk is pretty much on the level from that point, except for some minor changes in elevation, as it horseshoes across the downs and then descends over the final hole back towards the clubhouse. 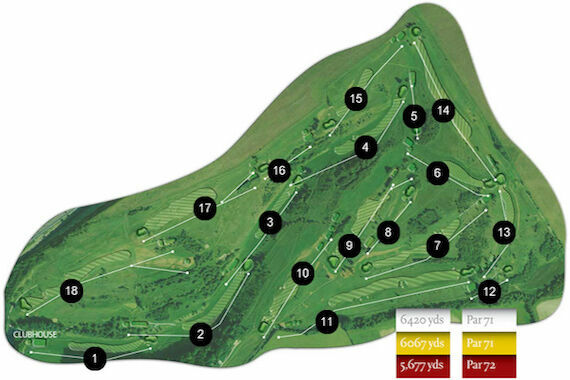 At 6,067 yards off the yellow tees and 6,420 yards from the white tees, the par 71 course (par 72 for ladies at 5,677 yards from the red tees) is not long by modern standards and is enjoyable for every standard of player. The wind is Hockley’s great defence and when the breeze is up it’s a great challenge for even the best golfers. The course has benefited from significant recent improvements and more work is planned to ensure that it continues to provide the best possible playing surfaces.